Having said this, some general cleaning advice which worked for me, but note that I am not responsible for any damages! 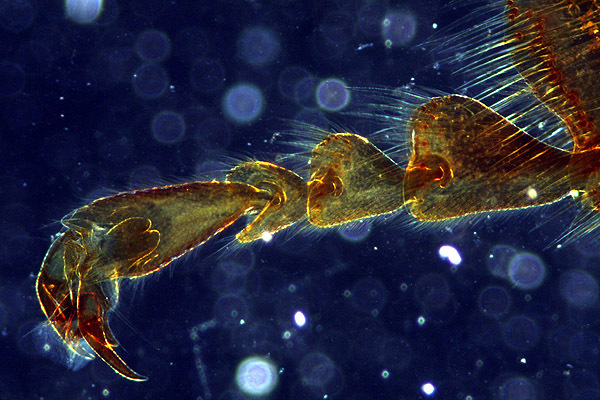 Water: Use water to remove dust from the body, stage, lamp (non-optical parts) of the microscope. Moisten a piece of lint-free cloth and remove the dust. Be careful when cleaning non-metal (plastic) parts, they may be scratched. Ether:alcohol (80:20 or 70:30, depending on manufactuer): Moisten a cotton swab and clean the optical surfaces, such as the front lens of the eye piece, in a circular manner. Lens paper should not be used, as it may scratch the optical surfaces. The ether makes the solvent volatile, there is not much time for the cleaning solution to adversely affect the optical coatings and/or the lens kit. Cleaning fluid recommended by the manufacturer: Use as specified! Cleaning fluids made for computer screens: What do they contain? How aggressive (or not) are they? You do not want to risk the removal of the optical coating of the lenses. Cleaning fluids made for eye glasses: They too may contain substances that harm the coating of the lenses. Tissue paper or cloth made for eye glasses: they may contain additives that could scratch the optics. Use lens paper instead. Compressed air: Many compressed air cartridges for electronics contain additives that will form a milky layer on the optical surfaces. There is also the danger that you will frost the glass (expanding gasses have a cooling effect) and the rapid cooling may not be the best for the lenses. Don’t use them on optical surfaces. Other solvents: Acetone, xylol, etc. They may either attack the plastic parts and/or may dissolve the kit holding the lenses in place. 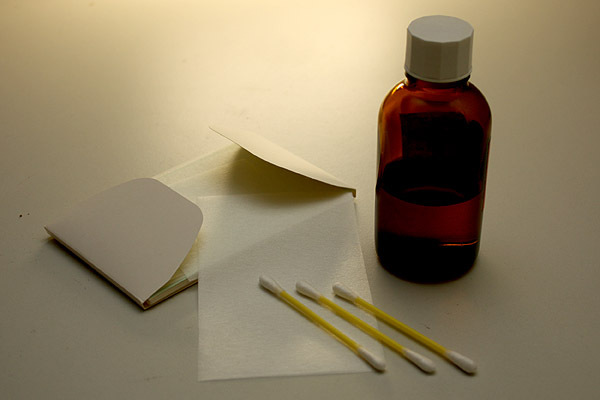 Cotton swabs made for medical uses: they may contain disinfectants or other additives. Denatured or rubbing alcohol: Additives in the alcohol make the alcohol taste bitter. These additives also form a smear on the optical surfaces. Cleaning the Eyepiece: First blow away the dust. Dust is able to scratch the surface. Then take a cotton swabs (real cotton, not artificial fibers). Moisten the swab with the appropriate cleaning fluid and make sure that there is no excessive liquid on the swab. Clean the eyepiece with the moistened swab. Then wipe the lens dry using lens paper. Do not apply too much pressure. Cleaning the Objectives: Immersion oil is first removed by carefully (no pressure!) wiping the objective with lens paper. You can then use the cleaning fluid recommended by the manufacturer. Do not dip the objective into the solvent (this should be obvious, but you never know what some folks are up to…). Apply the solvent to the lens paper. Cleaning the Microscope Stage: This can be done with a moist cloth dipped in an appropriate cleaning solution. Scratching of the stage should not be a problem (it’s made of metal), but do take care of the condenser lens! Cleaning the Condenser: The same things apply as for the objective and the eyepiece. First remove the dust, then use an appropriate cleaning solution with cotton swab and wipe dry with lens paper. It disturbs the quality of the image. Especially dark-field illumination is very sensitive to dust. Even the smallest dust grains show up. Over the years the oil in the gearing (focus knobs, condenser knob, and of the mechanical stage, etc.) will collect dust and start to solidify, making the mechanics difficult to operate and increasing wear. Dust grains located between the condenser and the slide may scratch the condenser lens when moving the slide. The distance between the slide and the condenser lens is very small if the condenser is moved into the highest position. Lens paper, cotton swabs and an appropriate cleaning solution. Darkfield microscopy is very sensitive to dust. Notice the bright spots (dust) on the dark background. This dust is not visible in bright field.